The Blogger comments system is a lot better than it used to be, but I never really cared much for it. I couldn't reply to comments without visiting the blog itself. I couldn't respond to specific reader comments. I hated the CAPTCHA system, but hated spam even more. So quite some time ago I switched to, in my opinion, a much better option: Disqus. 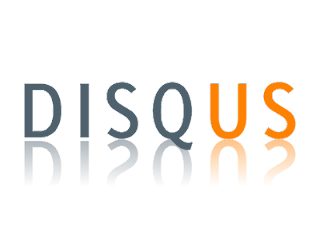 Disqus is a comment system that works great with Blogger, and it is used by many bloggers (on Blogger and many other blog/website platforms) all over the web. 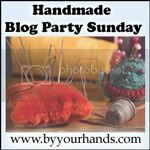 I've been using it here on Tattered Sisters almost since I started the blog. I use it on my Tumblr blogs as well. It is really easy to use. It has eliminated virtually all spam comments since I started using it. I kid you not! And it allows people to comment using the Name/URL/Email option, or via Facebook or other social networks, or via their Disqus profile (if they have one)--no CAPTCHA required! And if you run into any problems, Disqus has great support to help you install and get started using their comment system. I have no complaints at all since I started using Disqus. I highly recommend it to anyone! If you wan to learn more about it, just click on the image above and that will take you to the Disqus website. And did I mention, it's FREE?! Worth a peek, even if you decide not to use it (although I don't know why you wouldn't!). Time for another bit of Shabby Prim goodness. This time I'm sharing with you my Shabby Prim Bucket Light. I took a small Rusty Tin bucket, and I added some cream-colored lace to the upper edge of it. I also added a cute little satin flower to the front of the bucket. Then on the inside is a battery operated votive candle. I know, you can't see it. I forgot to snap a photo of that part. LOL What I love about this is that it's so easy to do and yet it looks so cool. It's a great little piece of Primitive Lighting that also fits the Shabby Prim bill. You could make a bunch of these for a party and they would be wonderful table lighting and decor. Then give one to each of your guests as a party favor to take home. Or you could wrap one up and give it as an individual gift. They'd also be cute sitting on your kitchen counter or on a little shelf. Or hang them from hooks somewhere inside or outside your home! They cast a nice, warm glow when the light is on. I promised you more goodies in my new Shabby Prim category, so I best live up to my word. :) This was project number two that I created last weekend, my Shabby Prim Canvas. I created this basically the same way I created the Shabby Prim Bag. I used a little bit of spray adhesive on the back of a paper doily, then I positioned it where I wanted it on the canvas. Next I sprayed on a coat of my brown textured spray paint (on the top and sides), let it dry, then sprayed it again. Then I removed the the doily. I LOVE how this looked right at that moment, but then I decided to add a little brown satin bow to it too, for just a little extra touch. So this has that rustic, grungy primitive look, with a touch of shabby chic too. It's a 6" canvas, so it could go in so many places. But I haven't made up my mind as to its final destination yet. I do love how it turned out though! 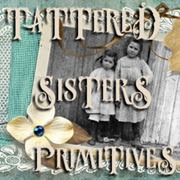 I decided to started a new category here at Tattered Sisters, and it's called Shabby Prim. I decided on this over the weekend as I was getting creative in my studio, trying to come up with new primitive crafts to create. This Shabby Prim Bag is the first thing I came up with. All you need to make this shabby prim bag is a ready-made plain muslin bag (no sewing necessary! ), a paper doily (you could use a cloth one too--but I didn't want to ruin a real one), some spray adhesive, and some brown textured spray paint. First I sprayed a little adhesive on the back of the doily, and then placed it over the bottom edge of the bag. You can place it as high or low as you'd like. Once that was in place, I sprayed it with the brown textured spray paint. I let that dry (with a little help from my heat gun) and then gave it another coat. Then I removed the doily and voila! It was finished. :) You could spray the back too, of course, especially if you're using this as a gift. But I just did the front side on my sample so that you could see the results. I love the combination of the Grungy Goods look, and the touch of shabby elegance that the doily provides. And the textured spray paint actually gives the bag the look of old leather, which was a happy accident! I love when that happens. You could fill this bag with grungy candles, pip berries, Sweet Annie, drieds, or whatever you'd like. What do you think? I love old vintage bottles. They are probably some of my favorite Vintage Goods in my home. Vintage bottles look primitive without having to do anything to them, and they tell a story about the past...even if we may not know what the story is. You can put them anywhere and they add a wonderful touch to your home. Add them in a group and you have a collection. Add them individually to someplace you need a little contrast in texture or height in your decor and the bottle will balance things out for you. Some people like to clean their bottles up and make them shiny, but to me that defeats the whole purpose of using vintage bottles. I want them to look old and grungy! I want them to have character. I want them to echo their story from the past, even if it's just a tiny, mysterious glimpse. Don't you?